JLG Industries Inc., an Oshkosh Corporation company and a leading global manufacturer of aerial work platforms and telehandlers, featured a variety of future-ready products and technologies at the ARA Show, February 18-20 in Anaheim, Calif.
JLG AccessReady XR provides virtual reality-based training for operators including controls familiarization, machine operation and advanced spatial awareness challenges. There is a boom package currently available for purchase with a scissor option coming later this year. This optional safety tool allows rental companies to safeguard their machines and it adds a layer of additional protection for end users by preventing unauthorized personnel from accessing equipment. Machine operators receive a unique ID number or smart card that allows them to access only the equipment they are authorized to operate. EDS is an evolution of the existing JLG Soft Touch System, which uses proximity switches to stop a machine when it makes contact with an object or structure. EDS uses innovative ultrasonic technology to sense when an object is nearby — first slowing, then stopping the machine before it makes contact. The industry-first app enables users to drive, steer and load R Series scissor lifts while in a stowed position from an iOS mobile device. The app is available as an option on new R Series scissor lifts, or available to purchase as an aftermarket option for existing machines. 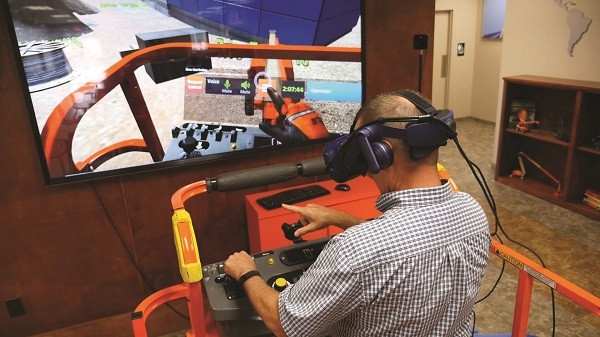 In testing, it was proven that the learning curve to use the app to move the machine around the job site took only minutes, even for inexperienced operators. JLG will showcase two of its newest R Series scissor lifts. The new 2632R lift allows operators to drive through a single doorway and work indoors at a height of 26 ft. The new 3246R features a unique lightweight scissor and is ideal for applications that require a lightweight machine with a 32-ft platform height. Among the innovations, customers will appreciate the exclusive variable tilt technology, which allows operators to elevate to limited heights when working on slight slopes, maximizing the work envelope. Currently available for the 1644 and 1732 high capacity telehandlers, SmartLoad Technology will soon be an available option for all JLG telehandlers. SmartLoad features an advanced bundle of three integrated technologies that work together to increase operator confidence and optimize productivity. Get more JLG news here!